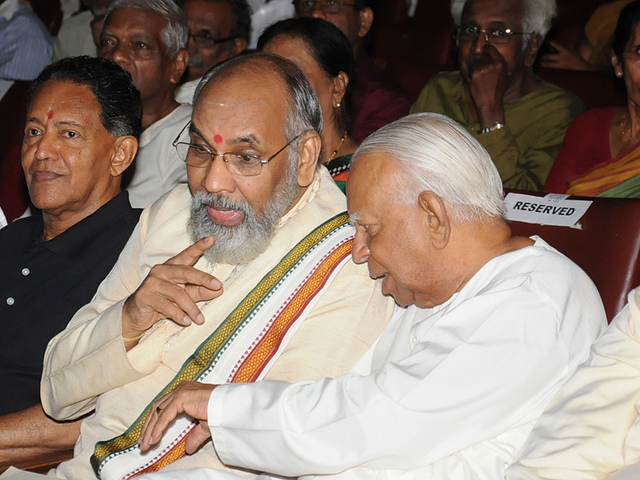 A Chola Tiger within Wigneswaran Swamy and the TNA? NOTA BENE…. 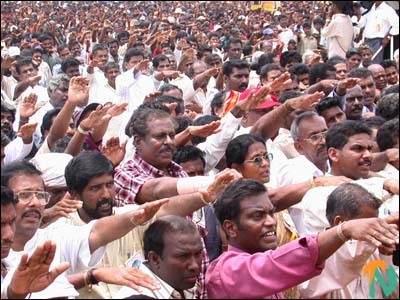 Scenes from the Pongu Thamil Rally held at Trincomalee in late 2002….. see “Militarism, Personality Cult at Trinco Rally,” Sunday Times, http://www.sundaytimes.lk/020324/frontm.html. It is extremely worrisome to read the election speeches in the Tamil language coming from those who are fighting it out in the North. It is also fortunate that most Sinhalese cannot read Tamil and recognize the return of the Tiger’s growl. Nevertheless it is surely designed to infuriate the south. The diaspora would love to see another communal pogram and stridently call for R2P. This is only a provincial election. However, the sounds are unmistakable to some of us who heard these rumblings even in 1952, when the clarion call for Arasu in our ‘own exclusive homeland’ was called for, with glorified accounts of reviving the old Tamil kingdom of Jaffna. In 1952, it seemed to be the political platform of the lunatic racist-fringe of the Tamils, led by some upper-caste lawyers living in Karuvakaddu (Cinnamon Gardens). They were roundly rejected. At that time the Tamils were doing very well, with in-roads to everything in Ceylonese society, just like the Jews of New York who were into every fountain of power. However, unlike the Jews of New York, the Tamils of Colombo ran the government -Arasu- for the British. Once the British left, this became less clear. The Jews of New York were not interested in an Arasu within USA, and knew with Solomon-like wisdom that they should not attempt to ask for an official or even an unofficial status for Yiddish. No, they don’t want any minority stripes on the US flag, or any singing of the national anthem in Yiddish. They prefer to discretely exercise immense power over the government instead. The Tamil leaders were not shrewd bankers like those who ruled New York and the USA. They were cantankerous lawyers who delighted in disputes and admired their own hubris. The Tamil lawyers were also absentee landlords who ruled the North from Colombo, and did not want any interference in their estates by any government, unless they themselves were the government. E. M. V, Naganathan, a leader of the ITAK, declared that his ancestors were Chola aristocrats, who honoured the symbol of the Tiger, and that he cannot ever accept the Lion. Ponnambalam too had said similar things in the state council (see Hansard, 1935, Column 3045) before his re-orientation by D. S. Senanayake. The Tiger virus was already there, but dormant. However, a newly independent country, with a huge Sinhala Buddhist majority that had an ancient unifying Epic would not remain subjugated for ever. Such nationalist forces were exploited by Bandaranaike to come to power, and he stroked the fires well beyond what he could control. 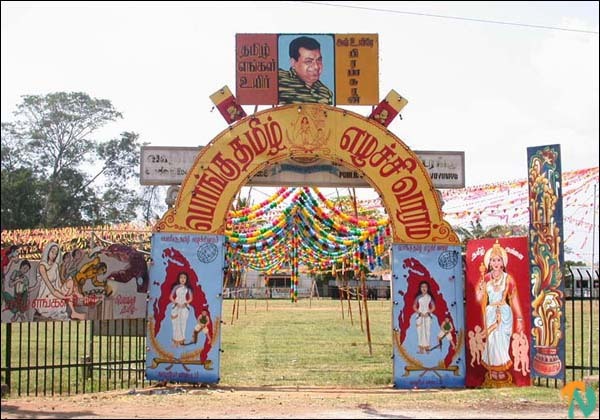 This ignited Tamil nationalism as well, with the Ilankai Thamil Arasu Kadchi (ITAK) capturing the torch from Ponnambalam and setting fire to the north, applying tar on the Sri letter of car-number plates, printing Eelam stamps, and holding `Sathyagrahas’ that were violently attacked by Sinhala thugs. The attacks converted extremist Tamil politicians into Tamil heroes overnight. The wild fire that was set off by that generation of Colombo Tamils was hijacked by the militant youth of Jaffna after Vaddukkoddai. They pitted the Tamils against a ten-times bigger majority, and the Tamils ended up defeated, with most of our people decimated by the army, and equally by the Tigers who killed as many or more Tamils to suppress dissent or rebellion, even though the Eastern Tamils under Karuna finally rebelled. That left no room for new leaders to rise. Elections are being held too soon, in a war-ravaged land because the Tamils of the south and the NGO-dominated Colombo “civil society” demanded it. The cowardly Tamil leaders who lived safely in the south, or outside the country have once again come forward to “lead” the Tamils of the North. They even want to take over the East by merging it with the North. What is strange is that the same old virus, the Tiger Virus, has consumed them and their new man, Wigneswaran. He was hailed (e.g., by Dayan Jayatilleke) as a person with a balanced, ethnically non-partisan vision. In reality, he was brought in by that aging Tiger, Sampanthan, so that he could control the North via the politically inexperience ex-Judge. 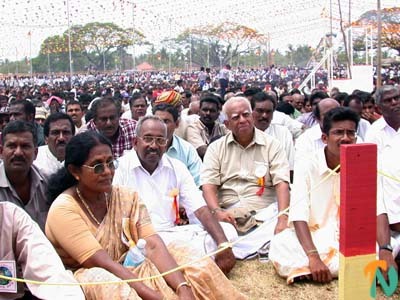 Sampanthan had shown his tiger stripes as recently as in the Eastern- province elections last year. Now we have the TNA manifesto, and the election speeches. Neither Sampanthan, nor Wigneswaran has bothered to spell out an economic plan, or a plan explaining how they would deal with the well-founded Sinhalese fears of Tamil extremism and intransigence that led to half a century of turmoil. According to a news report, Mr. Wigneswaran has even referred to the armed option, “if the aspirations of the Tamils are not met”. Is he already working on the “TNA boys, as did the old TULF after Vaddukkoddai. Indeed, these Tamil leaders just the same “Timpu Tamils” of Colombo 7 who are once again ready to pit a weak Minority against a powerful victorious Majority, counting on the “international community” to intervene – no matter the ensuing blood shed! Wigneswaran has now begun to tell us that Prabhakaran, that Pol-pot of the Tamils is a great hero and freedom fighter! So was Hitler to the Nazis. The spirit of the virulent Kasi Ananadan is also being invoked. Wigneswaran does not realize that he has become the latest human sacrifice to the man-eating Tiger of the Cholas. 1 Response to A Chola Tiger within Wigneswaran Swamy and the TNA? At least now the average Sinhalese & Tamil should realise to unite and fight against the politicians instead of killing each other. This Island is everybodys and everybidy should live here like brothers & sisters.